Trial Justice John Tsoho of the Abuja Division of the Federal High Court has okayed hearing on the suit seeking an order to compel the Federal Government to prosecute some persons accused of assisting the leader of the proscribed Indigenous People of Biafra, IBOB, Nnamdi Kanu, to escape from Nigeria. The suit, is praying the court to issue an order of mandamus to force relevant security agencies, including the Police and the Department of State Service to promptly initiate criminal action against those accused of complicity in Kanu’s escape. 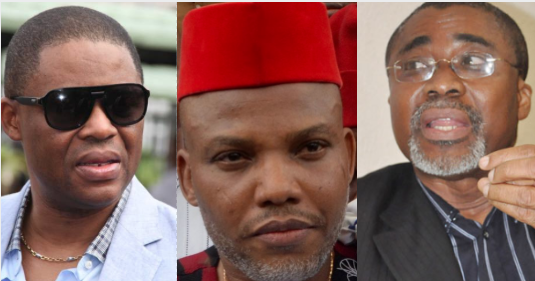 Those the suit is seeking their arrest and prosecution include Senator Eyinnaya Abaribe, a former Minister of Aviation, Mr. Femi Fani-Kayode, and two other persons that stood surety for the IPOB leader, Tochukwu Uchendu, and Emmanuel Shallom Ben. Specifically, the Plaintiff, Mr. Isiah Ayugu, who secured leave to commence the action on Friday, in his suit marked FHC/ABJ/CS/1254/18, insisted that the Respondents have a case to answer. Ayugu, through his lawyer, Mr. Oghenovo Otemu, prayed the court for an order mandating all the Respondents in the case to investigate and prosecute Abaribe and the others, including Kanu’s lawyer, Mr. Ifeanyi Ejiofor, for “working together to propagate and spread lies and falsehood that Kanu was abducted, kidnapped, arrested and detained by the Nigerian Military, when indeed they were well aware of Kanu’s whereabout because they played roles in helping him to disappear from Nigeria”. He said so much pressure was asserted on the federal government and it’s agencies by Senator Eyinnaya Abaribe, Femi Fani-Kayode and the others. Meanwhile, the court has fixed November 22 to hear the suit.